TOUR INCLUDES URBAN FAMILY, FIGUREHEAD AND ROOFTOP BREWERIES. We are not going to lie, this is our longest tour and it is not for whimps. The total walking distance is 1.2 miles and parts of the walk are not in the fanciest part of town. Each brewery features traditional beer styles and we'll learn a bit about them, the brewery and some brewing history. These small neighborhood brew pubs are also famous for their innovative and unique styles. Whether you are an experienced cerevisaphile or trying your first ale or lager I guarantee you that you'll find something that you've never tasted before, something you might not care for, and something that you will love. If you have never been to Seattle's brewery scene you will find the atmosphere warm and inviting, and most brew pubs are family and pet friendly. We will meet at Urban Family brewery. If you drive you can park near here are at the Fisherman's Terminal, a half-a-mile walk way. Here you will find hidden among the warehouses and industrial buildings surrounding the Fishermen's Terminal is a little gem of a brewery. In Urban Family's Tasting Room, inspired by French and Belgian farmhouses, we are going to sample ale styles not often found outside of Belgium, but with a distinctly Northwest twist. We've had a nice walk, now let's try some truly amazing beers. The Figurehead is the carved bust or figure set at the prow of an old style sailing ship. Directly across from the Terminal this small brewery honors the history and culture of the neighborhood. Only half a mile from Urban Family, Figurehead represents an entirely different brewing tradition. I think a British seaman from the 19th century would find ale here to his liking. After Figurehead we will walk to the Seattle Fishermen's Memorial, dedicated to the nearly 500 Seattle men and women who have lost their lives at sea since 1900. 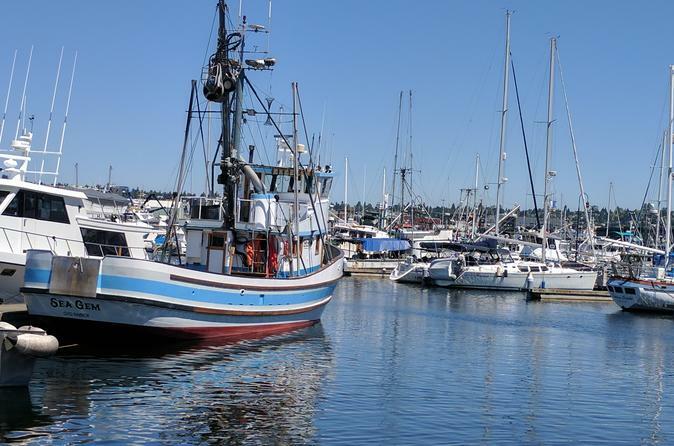 For over a century the Terminal has been the home port of the North Pacific Fishing Fleet and is home to several of the vessels featured in the Discovery Channel's TV show "The Deadliest Catch." This of course is not the point of the tour, just a pleasant point on the trail to our next beer, but we will learn a bit of maritime history along the way. The last leg of our epic tour brings us under the Ballard Bridge to Rooftop. Steeped in the traditions of Northwest brewing we may find a Cascandian Dark Ale, or an ale infused with coffee from next door's Zoka Coffee Roasting Company. Coffee and beer, two of Seattle's favorites in one glass. If its a nice day, and it usually is in Seattle, we'll sit in the rooftop patio and enjoy a beer well earned.